If you plan on driving to Canada or renting a car when you're here, educate yourself on some of the basic rules of the road. For the most part, driving in Canada is very similar to driving in the United States, but there are some overall differences (especially in that speed is measured in kilometers per hour, not miles per hour) as well as some provincial rules of the road that vary (e.g., no right-hand turn on a red in Quebec). You need a valid driver's license to drive a car in Canada. U.S. drivers licenses are valid in Canada but visitors from other countries are advised to get an international driver's license. In addition, proof of auto insurance is required. U.S. auto insurance is accepted if you are a tourist in Canada. Laws vary by province or territory but the following are some Canada driving basics. In case you were unaware, in Canada, people drive on the right-hand side of the road, but speed limits are posted in metric units. Common speed limits in Canada include 50km/hr (31 m/hr) in cities, 80km/hr (50 m/hr) on two-lane highways, and 100 km/hr (62 m/hr) on major highways. Depending on what province you're in, road signs will be in English, French, or both. In Quebec, some signs may only in French. Canadians take traffic safety seriously. Everyone in the car is required to wear a seatbelt. Distracted driving laws apply across the country but may vary by province or territory. Cell phones must be used "hands-free" when driving. Some provinces have introduced HOV (High Occupancy Vehicle) lanes in dense urban areas with heavy traffic. These lanes are restricted to use by cars with at least 2 people and may be marked with diamonds or otherwise. Car seats are required for children under 40 lbs. and many provinces, including British Columbia, Newfoundland and Labrador, Manitoba, Ontario, New Brunswick, Prince Edward Island, Saskatchewan, and Yukon Territory, have banned smoking in cars where minors are present. It is very important to note that Montreal is the only place in Canada that does not permit right-hand turns on a red light. Don't underestimate how challenging driving a car during the Canadian winter can be. Heavy snow, black ice, and white-out conditions wreak havoc on the most experienced drivers. Check weather conditions for your destination in Canada before traveling and decide if winter driving is something you're ready to undertake. If it is, be sure to have a charged cell phone with emergency numbers programmed in and pack a car travel kit including things like a blanket, ice scraper, flashlight, and/kitty litter for traction. In some cases, like driving through mountains, snow or tire chains may be necessary for maximum traction. Driving under the influence of alcohol (DUI) is a serious offense in Canada and can result in a driving suspension, vehicle impounding or arrest. In fact, a DUI charge in Canada, even from many years ago, may result in your being denied entry into the country. Refrain from drinking and driving when you're in Canada and opt for a taxi or public transportation. See more about Drinking and Driving Laws in Canada. Toll roads do not play a significant role on Canadian roads; drivers pay tolls on some bridges crossing into the U.S.A and there is one in Nova Scotia. 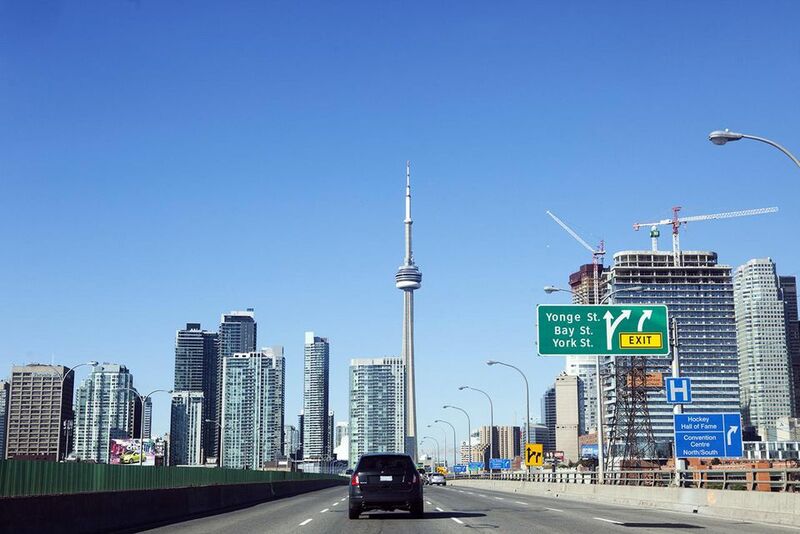 In Ontario, ​407 Electronic Toll Road (ETR) alleviates the heavy congestion on major corridors between Toronto and outlying areas, especially Hamilton. Stopping to pay at a toll booth, however, has been replaced by an automatic system where a photo of your license plate is taken as you merge onto the 407. A bill reflecting the distance traveled on the 407 is sent to you later, or applied to your car rental bill. How Can You Avoid a Speeding Ticket in Canada? Can You Bring Your Pets to Canada?